Thank you to Walmart for sponsoring today's post! Hi friends and happy Thursday! I'm so excited to share today's post with you all. It's pretty safe to say that I've shopped at Walmart for many different reasons in my lifetime: household items, cosmetics, groceries and much more. However, Walmart fashion is a whole new reason that honestly has my mind blown! Up until recently, I never realized that Walmart is also a fashion destination for the entire family! As I was browsing the website, I saw a wide variety of styles for prices that everyone can feel great about :) I say Walmart is a fashion destination, because you can search for just about any item, dresses, tops, shoes, etc., and find a large selection of brands. There truly is something for everyone! And many of the items you can order online and pick up in store. I want to share a little more about what I'm wearing here. How beautiful are the details of this lace trim OTS top! Can y'all believe it's only $15?! The details are so gorgeous, and it's always a great idea to have a good white top on hand. I will say that it runs a little large, so size down one size! But it comes in four colors and is so pretty. I was also so excited to find these designer jean shorts through Walmart fashion for a discounted price. However, I also love these and think they're such a great buy! Next, I want to mention this adorable circular crossbody bag. It's absolutely precious! I decided to go with the pale pink color, but it comes in a handful of shades and prints (including straw!). It's only $14. And lastly, I have to mention these pink sandals. They're pretty much amazing and come in four colors! They are also one of my favorite brands, made exclusively for Walmart. And as I mentioned, Walmart is also a fashion destination for the entire family. I love finding the basics for Madeline, such as this pack of white camisoles. She wears them under so many pieces, and they also work perfectly layered with a denim jacket and paired with a fun pair of pants. And I also find cute pieces, such as these rose print jeggings, that are so adorable and only $14! Hello friends and happy Tuesday! :) I hope y'all are having a great week so far. I'm so excited for today's post, because it's a look that I feel is a great one to have in your closet. I love having easy looks on hand that I can just throw on and go. And chambray is always a great idea! 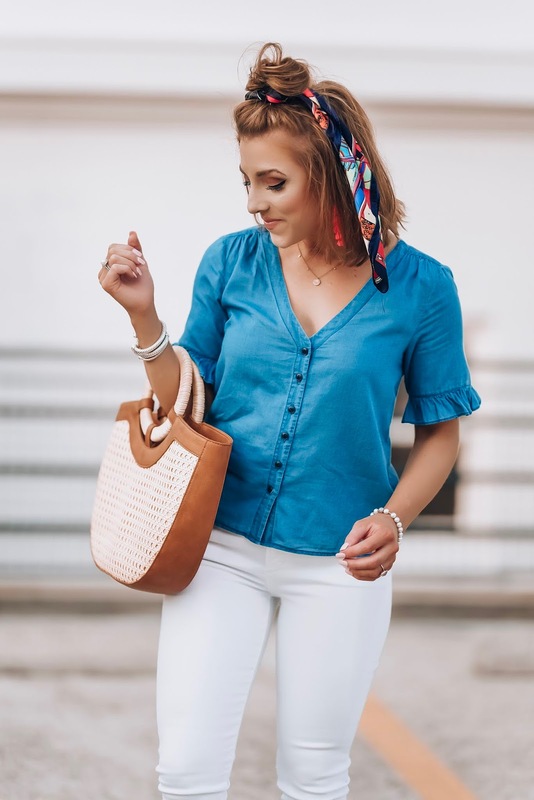 A good chambray top is timeless, versatile, easy to style, and something you can have so much fun with! 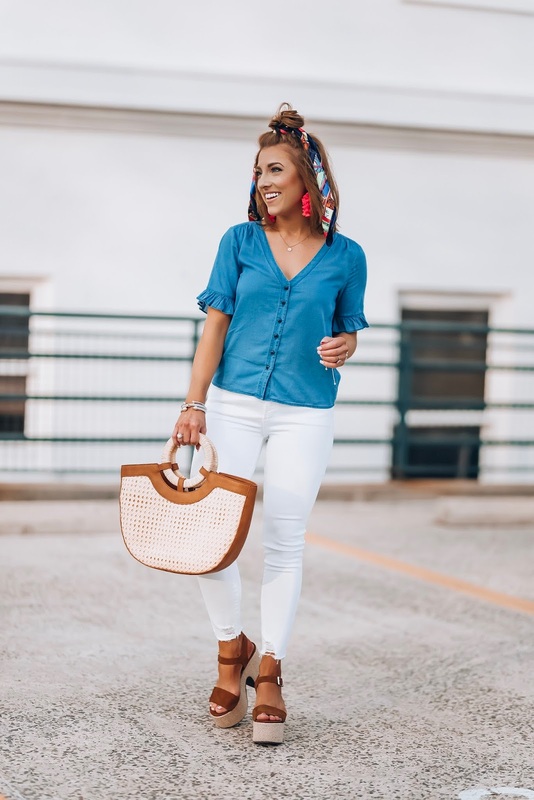 I especially love styling chambray with white jeans and cognac accessories. In today's look, I opted to add some fun pieces to the mix. Let's get started! 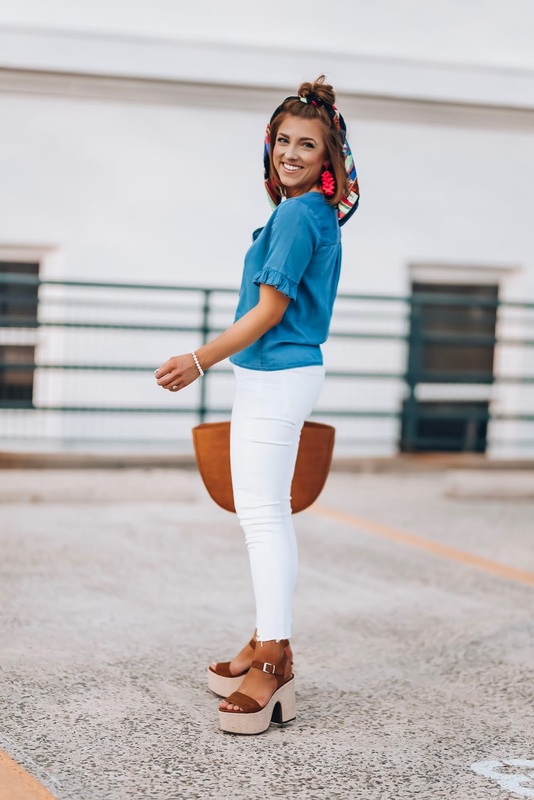 This ruffle sleeve chambray top is just the cutest thing! I cannot resist ruffles. When I came across this top, I knew it would be a go-to piece. It's comfortable and would also look SO cute tucked into a skirt. It does run a tad bit large (I got the xxs, for size reference), and feel it's the perfect fit! But if you wanted to tie it in the front, I'd stick with your regular size, just to allow a little more material to work with. Overall, it's just SO cute! It also comes in solid white (hello perfect white top!) and a fun pastel stripe print. I paired it with my new favorite pair of white jeans. As for my accessories, I added some fun ones to the mix! This $12 scarf is the cutest thing! 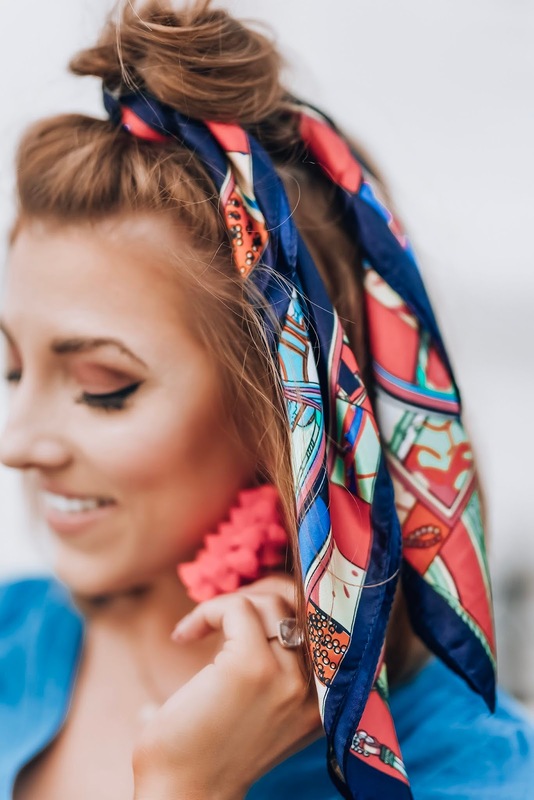 Scarves are so hot right now and such a fun way to add a pop of color. You can tie them in your hair, as I've done here, around your neck or on the strap of your handbag. I love the one I'm wearing here, because it's smaller, a light weight fabric, making it work with even short hair. I also decide to carry this amazing straw + cognac bag (Target find!!). It's under $40, has pockets on the inside and has a draw string closure. It's just the best bag ever!! I also had to share these iPhone snaps with y'all, because Madeline has the perfect matching look! Total blogger fail haha, but my camera actually died in the process of taking these photos and I forgot to bring my back-up battery. Luckily, we finished the shoot, but I wasn't able to take any with Madeline. If you follow me on IG, then you've already seen these :) But I think this is one of my very favorite mommy and me looks! 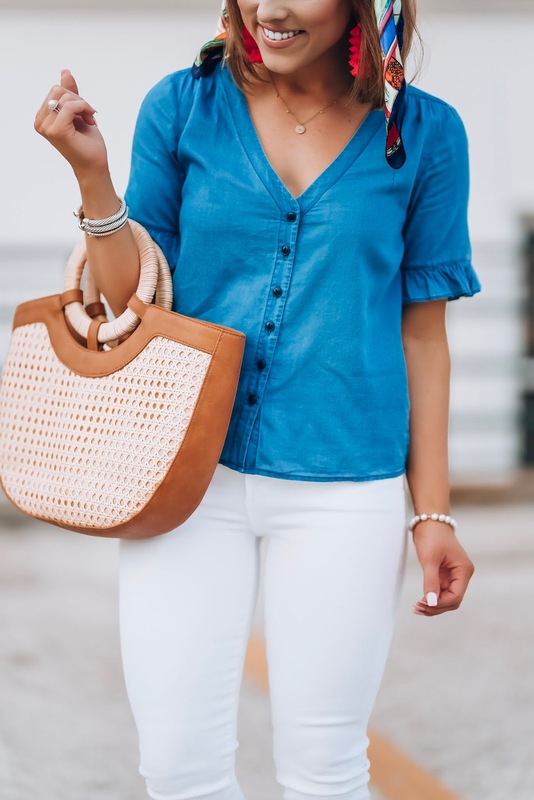 I just love her little ruffle hem chambray top! Today I'm SO SO SO excited to be sharing one of my favorite looks to every share on Something Delightful. Yes, it's a mommy and me look, and YES it's Lilly Pulitzer! If you're been following me from the very beginning, you know that my love for Lilly runs deep. I actually started this blog off of off my love for Lilly. My life has definitely evolved in many ways since the start of this blog, but I still love Lilly P., and love it even more so when I get to twin with Madeline in it. Also, when I have a big event, need to get dressed up for an occasion or twin with Madeline on a holiday, I always know that I can find something Lilly for us to wear. For my sister's bridesmaids luncheon a few weeks ago, I got the amazing pearl shift dresses for us to wear. To say they're amazing would be an understatement! I had planned to shoot this look the day of the luncheon, but with the rain hitting us the entirety of that day + the craziness of basically leaving the luncheon and getting ready for the rehearsal an hour later (what was I thinking about finding time to shoot haha?! ), we had to get dressed up again in these looks and shoot them once we arrived back home. I would definitely say the Pearl Shift dress runs TTS. I got mine in the size 0, and it fits perfectly. I decided to go up to the 4-5 girls size for Madeline because she is tall, and the three was too short on her. For a little warmth, because it can still be a little chilly this time of year, I added in the Lana scarf and the Langley cardigan to our looks. Have the best Tuesday! Thanks for stopping by. Hello friends and happy Thursday!!! 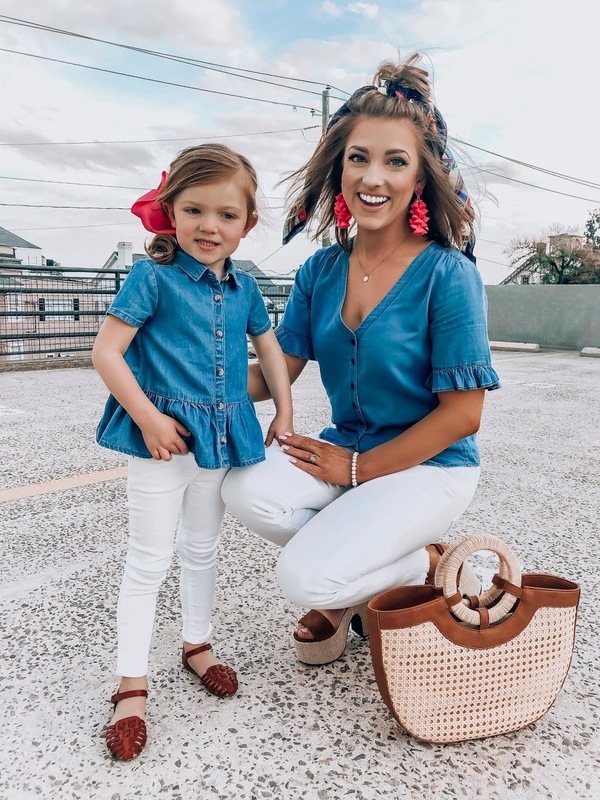 I hope y'all are having a great week so far :) I'm so excited to be sharing a super fun mommy and me look with y'all today. There are SO many good pieces to talk about in this post. 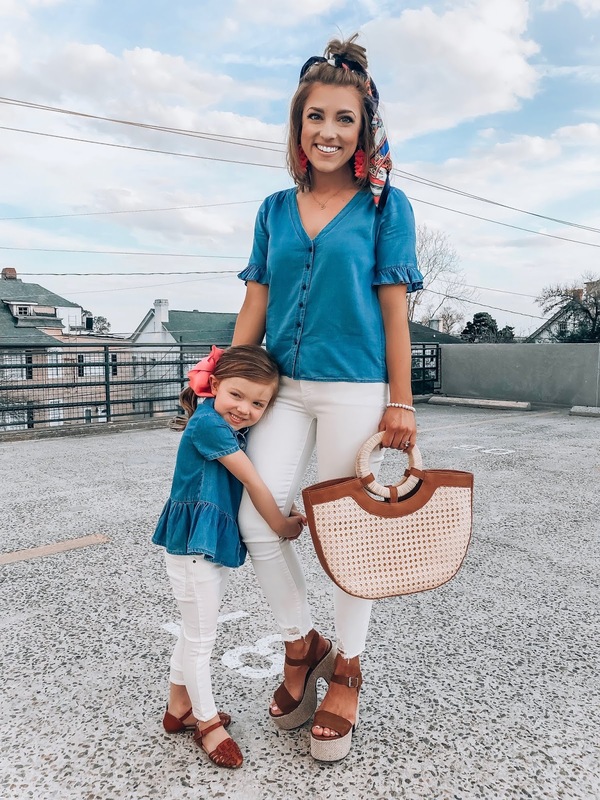 If you're dreaming of spring, I think these outfits are perfect to get you ready for the upcoming season, both you and your little one. Let's start off with this top! This striped peplum cutie was a huge hit last year, and I'm so excited that it's BACK again for this year! Last year, it would hardly stay in stock, but it's fully stocked in all sizes right now. It definitely runs TTS (wearing the XS, for reference). I love it with both a dark wash jean and white jeans. It also looks SO cute with shorts for summer. 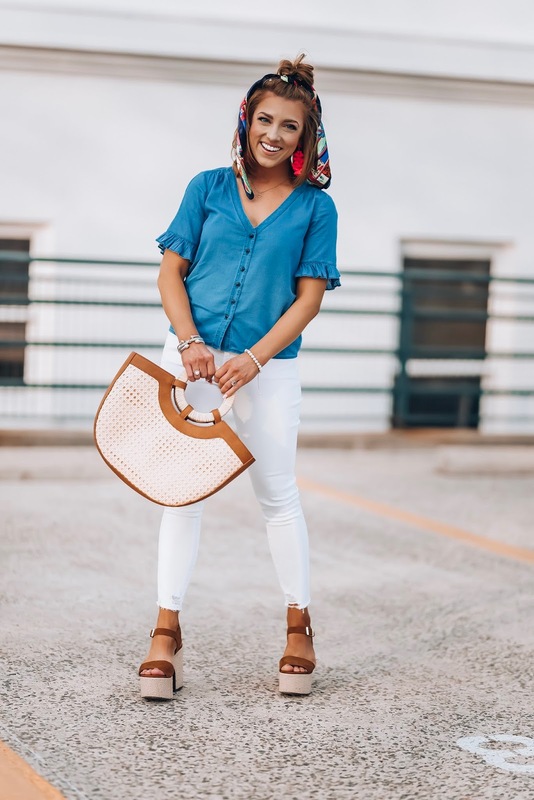 Trust me when I say you need it in your closet :) I decided to do a little bit of print mixing as well, and pair it with these amazing leopard print scallop sandals. They come in three colors (I also have them in yellow). They do run a bit large are stretch with wear, be sure to size down one size. 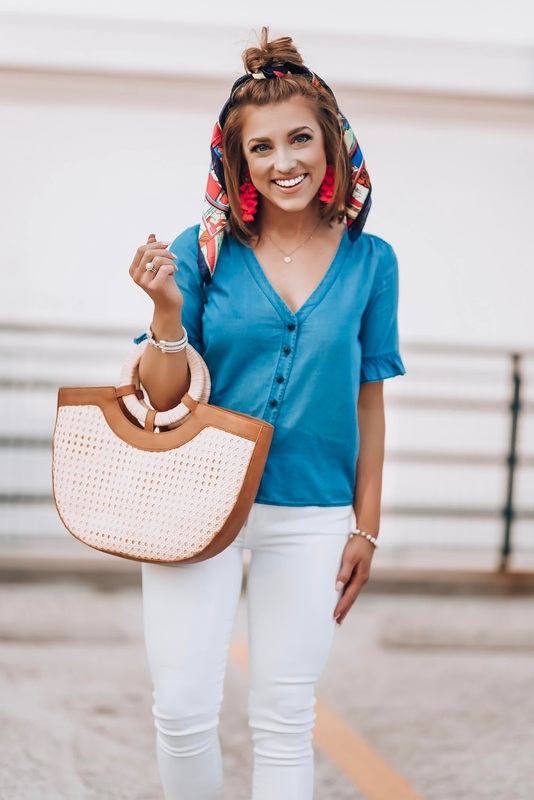 The last thing to mention here is this bucket bag! Y'all it's just about the cutest thing!! Oh and it's under $50! It also comes with a longer strap so you can wear it cross body. I just love it. Now for s little on Madeline's look. I just about died when I found this strip, bow-back romper with ruffle details. It's the cutest thing! It is also such a fun pairing with my top for the perfect mommy and me coordinating look. I'm also so excited, because her brown sandals are back again for this year! They were a favorite of mine last year, and this year they're back and even better! I hope y'all have a great Thursday! I've been so busy planing Madeline's birthday party. Her birthday is coming up in a few weeks. I usually start planning her party by February 1st, but with planning my sister's wedding, I had to wait a few weeks for the birthday planing to begin. It' in full swing now! She finally decided on a theme, and y'all, I was not expecting what she chose haha! She's obsessed with mermaids, and I truly thought she would want an under the sea theme, or something like that. But she chose something completely different! However, I think it'll be so cute! It's really coming together, and she's so excited. The best part is that with the theme she chose, we were able to tie in two "mini" themes with it (both things she absolutely loves), so I think it'll be just perfect. I can't wait to share more! Hello friends and happy Friday! If there's on thing I get excited for with the start of every season, it's SHOES! I pretty much have a shoe weakness, and I get it from my Mama haha. Her love of shoes has definitely rubbed off on me. I'd rather have a cute pair of shoes over any other accessory or piece of clothing any day. I love for my shoes to be the focal point of my looks. 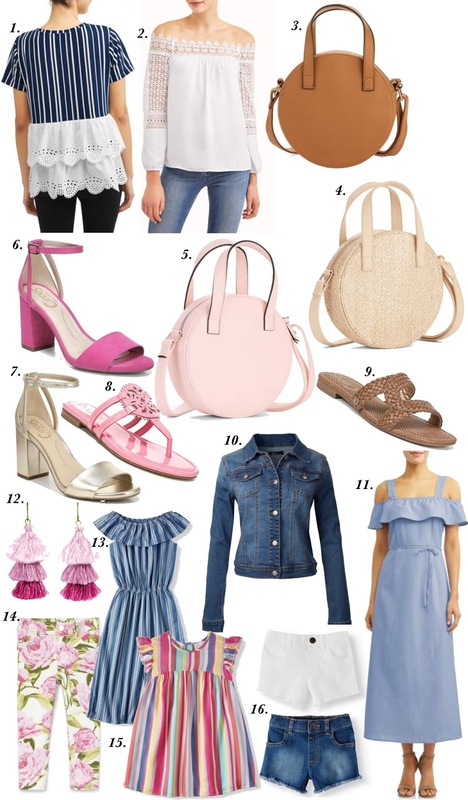 With spring being just around the corner, I've been stalking all of my favorite stores these last few weeks to narrow down my favorite shoes for the season. I've already purchased a handful of these haha, and today I'm so excited to share all of my favorites with y'all! Do cute shoes have you excited for spring?? Which pair is your favorite?